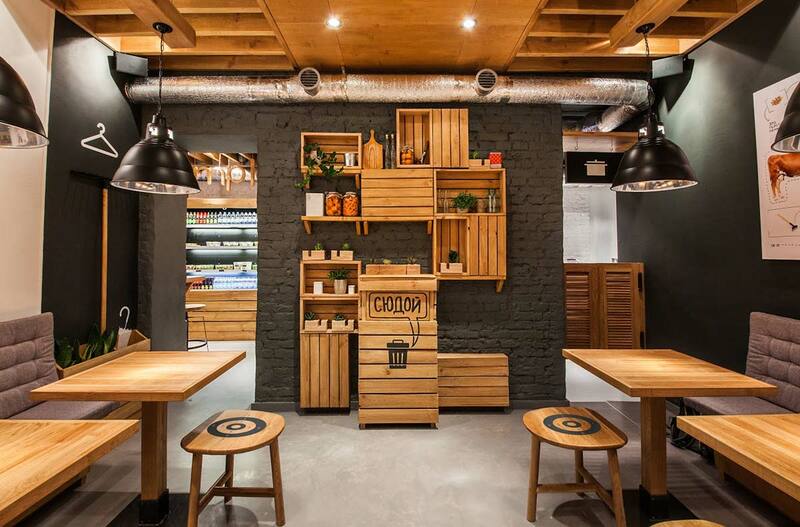 Pulling together a tight team sharing a united vision, Anna Domovesova took hold of the Simple project and helped bring sustainable menu items and complementary products to the storefront and kitchen table of this Kiev, Ukraine eatery. 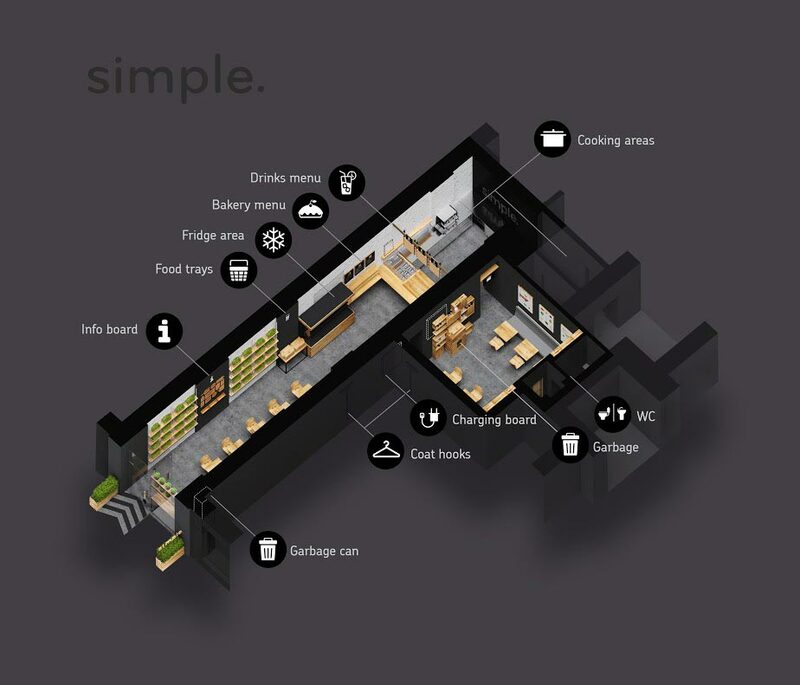 Simple is not only a restaurant boasting of quality local cuisine soaked in a potpourri of tastes and textures, it is also a brand of products that make the entire dining experience a signature event. 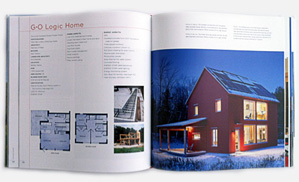 Stepping away from the fluff of some modern-day marketing ploys, Simple took an approach that is reflected verbatim in its name – simple. With only 16 meters in length to work with, and 2.7 meters in width, Anna dialed the design elements back to when life sang to a simpler tune, and relationships offered a beautiful forefront. 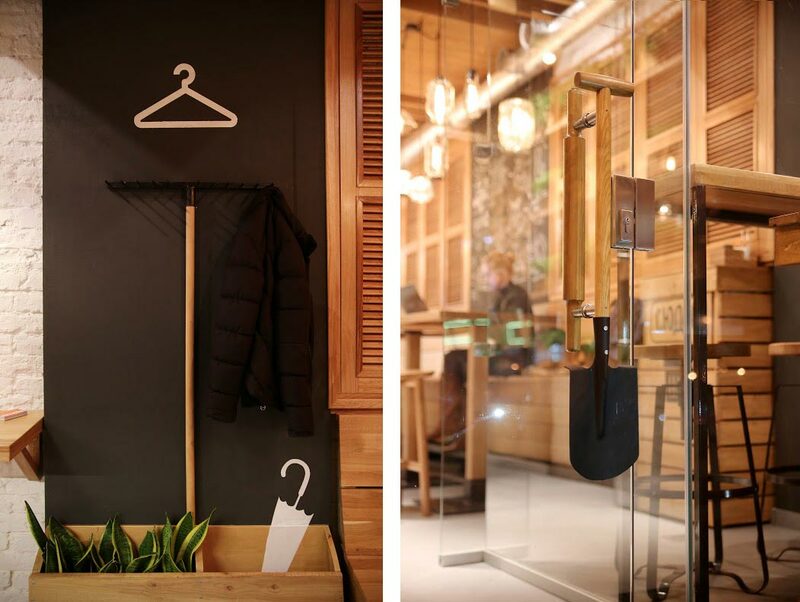 Simple allows you to feel the intended experience as soon as your hand lands upon the shovel door handle, you hang your scarf up on the rake coat hooks, and you sit down on a bulls eye printed wooden stool. Although here life is simple again, it is not without it’s imperative sense of humor. 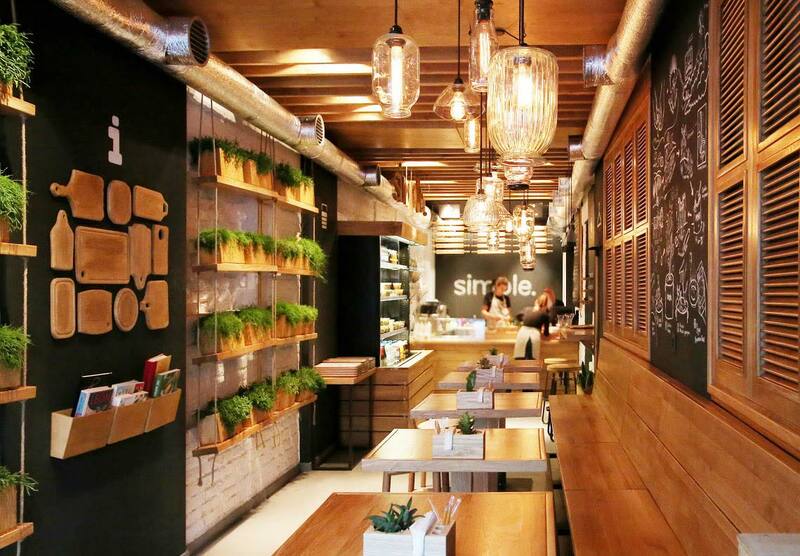 A living wall lined with suspended foliage, and broken up by a middle panel dedicated to wooden cutting boards, decorates the main narrow dining section. 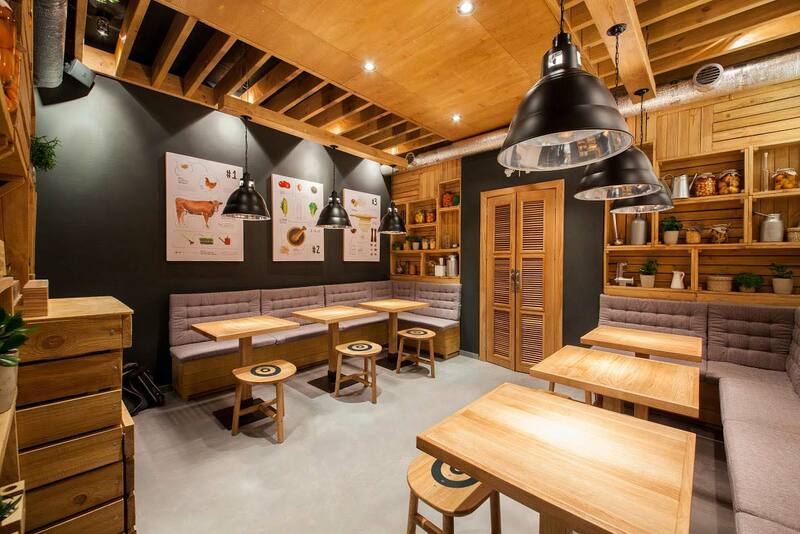 While rich honey pine wood tables and chairs are backed by shutter-lined walls, and mason jar/Edison lights drip from the ceiling, creating an old-world feel balanced by modern comforts. 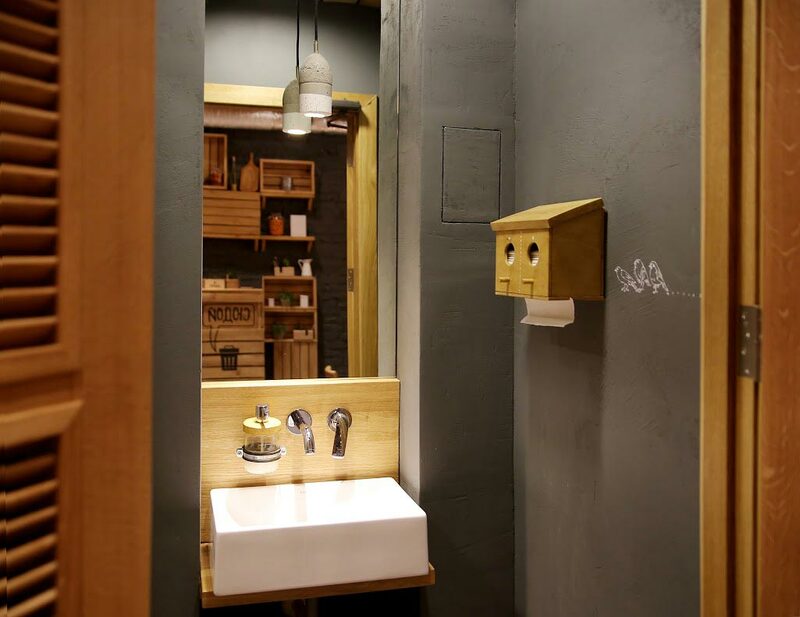 The alternate dining room offers crate boxes filled with small plants and a smattering of canned goods, while further away the water closet has Sigmund Freud offering you a porcelain seat – cheeky consistency. 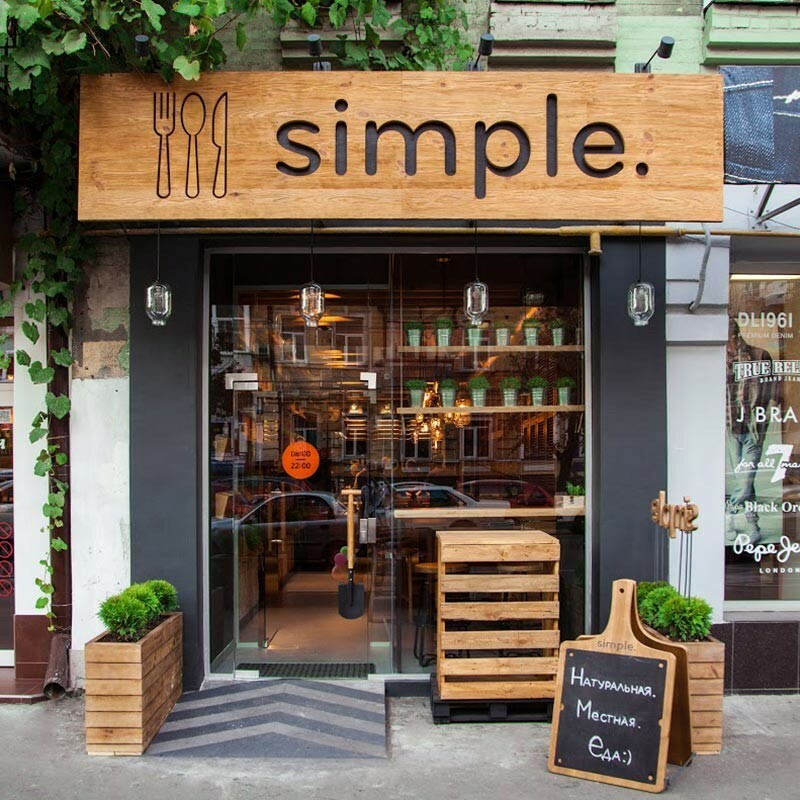 The core concept of Simple was “Be Simple, Eat Simple” …and Anna Domovesova and team definitely delivered on this concept without losing out on any design flavor or delicious local cuisine. Bravo for bringing the things that matter most to the center of our attention once again. For truly – it is the simple things in life that matter most!